Citing “new information,” the director of the U.S. Bureau of Land Management has asked federal investigators to reopen a probe into former Farmington BLM manager and current New Mexico Oil and Gas Association president Steve Henke. According to an Oct. 25 story in the Farmington Daily Times, Henke faces renewed questions regarding his tenure leading the BLM’s Farmington office after a previous investigation by the U.S. Department of the Interior found he accepted golf vacations and other gifts from the oil and gas industry. Before retiring from the BLM in May, Henke served for nine years as district manager of the BLM’s Farmington field office. He is now president of the New Mexico Oil and Gas Association, a trade group that advocates for industry interests. Today, as our country officially celebrates the “discovery” of a land already inhabited, I think it is a great time for New Mexicans to reflect on, and honor the past and present struggles for control of our land. Let me start with a quick story: This past weekend, I had the opportunity to be a part of the volunteer crew organized by the Kewa (formerly Santo Domingo) Pueblo to begin to repair the significant damage done to the Tribe’s traditional houses by the October 2nd hailstorm. Many homes have been deemed “un-inhabitable” and Kewa officials estimate that 90% of the homes in the old village have suffered damage to their roofs. The damage there is significant, but even more heartbreaking was the reality that as of Sunday afternoon, over a week from the storm, very little attention had been given to the situation from beyond the Pueblo. Tribal leaders had yet to hear from our state government in their request to have a state of emergency declared. Fight Climate Change on 10-10-10! Looking for something to do on 10-10-10? 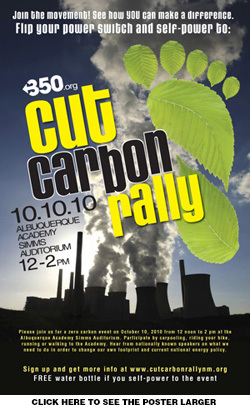 How about a 10-10-10 Cut Carbon Rally where you can hear about the latest in the fight against climate change and pick up practical tips to help you do your part? In Albuquerque, the rally will take place from noon to 2 p.m. in the Simms Auditorium at the Albuquerque Academy, 6400 Wyoming NE. It’ll start with an indoor program with speakers, including New Mexico Senator Tom Udall, New Energy Economy director John Fogarty, Native American environmental justice activist Louise Benally, Art Gardenswartz and others. There will also be video addresses by McKibben and New Mexico Senator Jeff Bingaman. During the second hour, people will have a chance to visit informational booths and to participate in workshops on how to compost, how to caulk and weatherize their homes as well as how to write letters and call elected officials to support reductions in carbon emissions. It’ll end with a bike raffle at 2 p.m.
Come out and celebrate the day in an educational yet fun way! Here is the local news report from WPSD-6, Paducah, Kentucky. Could we finally just put to rest the astounding notion that being an “environmentalist” should somehow disqualify you from being a member of the Environmental Improvement Board? I ask this in wake of the Oct. 2 Journal story titled “ GOP wants `Green’ Partisans Off EIB.” The story details efforts by some Republican legislators to force any EIB members with “known green agendas” to recuse themselves from deliberations on two proposals to cap carbon emissions that are currently before the EIB. According to the story, the legislators want the Attorney General Gary King to investigate possible conflicts of interests that specific EIB members might have regarding the two proposals. This is just the latest salvo in the epic battle over the makeup of the Environmental Improvement Board, an advisory board whose members are appointed by Gov. Bill Richardson. A story in the New Mexico Independent yesterday says Lovelace Health Plan will sharply limit the time period during which parents can buy child-only health insurance for their kids. Lovelace, which is one of the largest health care providers in New Mexico, said it will only allow parents to buy such policies during a one-month enrollment period each year, instead of maintaining open enrollment all year long. The decision is expected to result in a huge drop in the number of children-only policies Lovelace issues.